When I took the flank steak out to defrost I had no idea what would be accompanying it. I'm just hell bent on cleaning out my freezer and that seemed like the next good thing to eat. Instead of going to the green market last Saturday I opted for the little French-style open market that is also held every Saturday morning at the Nettlehorst School that is just around the corner from me. It is not my favorite market, because the largest fruit and vegetable stand does not seem to be local and consistently has a suspicious number of out-of-season items in stock, but every once in a while I will spend some time there because for whatever reason I did not make it down to the green market. In all fairness, I should say that there are a few other fruit and vegetable folks that are local, but there's not much variety there. The larger fruit stand did have some fresh brussels sprouts, which I have not purchased since I was in London in '85. They looked good, and I was struck by the impulse so I bought them, not having a really clear idea how I was going to prepare them. I did remember a recipe from the Good Housekeeping Illustrated Cookbook that calls for bacon, which sounded mighty fine to me. But I didn't think I needed a pound of bacon, and any that didn't get used in the recipe would be immediately consumed (I have no will power where bacon is concerned), so I thought I might be a little daring and go for some pancetta. If you watch the Food Network at all, then most likely you have had pancetta offered up by just about every chef on the network, especially Giada De Laurentiis on her show "Everyday Italian" (warning - there's sound on this site). I knew I could buy it in a smaller quantity in the Treasure Island deli, so I thought it might be a good time to try some. I bought just a couple of slices and brought them home. I wasn't sure exactly how I wanted to prepare this, so I did a quick search and actually found a recipe of Giada's on the Food Network. I took a look at it, decided on a few adjustments, and got started. And hit a home run on the first try. I will be bringing home more brussels sprouts in the future, that's for sure. The pancetta brings a lovely ham undertone to the sprouts, and combined with the subtle sweetness of the shallots make for a delicious dish indeed. And as much as I love all things flavored smoke, I think the pancetta makes for a more subtle, complex dish than if I had used bacon. Heat oil in skillet over medium high heat. Add pancetta and cook until rendered, about 5 minutes. Add shallots and cook a few minutes more. Cut sprounts in half and add them to the skillet, along with salt and pepper. 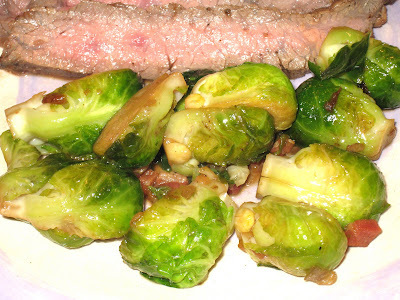 Cook until sprouts are well browned. Add the chicken stock and cook until the liquid has reduced by half, about ten minutes. Adapted from Giada de Laurentiis' "Everyday Italian."